The bigger the water dish, the happier the dog. 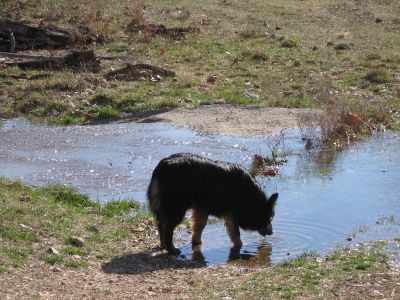 © FarmgirlFare.com, the fresh water foodie farm blog where Lucky Buddy Bear isn't the only one who loves it when our wet weather creek is flowing—except when it's flowing a little too much. omg, I see green grass! Can winter be over already? He does look like a bear in this photo! Nothing better than a fresh drink from a running stream if you ask me. (of course, i wouldn't but it sure sounds nice -- if only you were sure of its source and such.) Have a great week Farmgirl! I think it's officially over today--78 degrees! Oh, it's so nice to hear you say that. He looked like such a bear cub when he was a pup, and now I figure people wonder why the heck I named him Lucky Buddy Bear. P.S. Cute new profile photo!